Split Large OST File without large size limitation. MS Outlook installation is necessary to divide OST File. Split OST File by Date, Year, Folder & Size Options. Software Supports MS Outlook 2016, 2010, 2013, 2007, 2003, 2002 & 2000 versions. 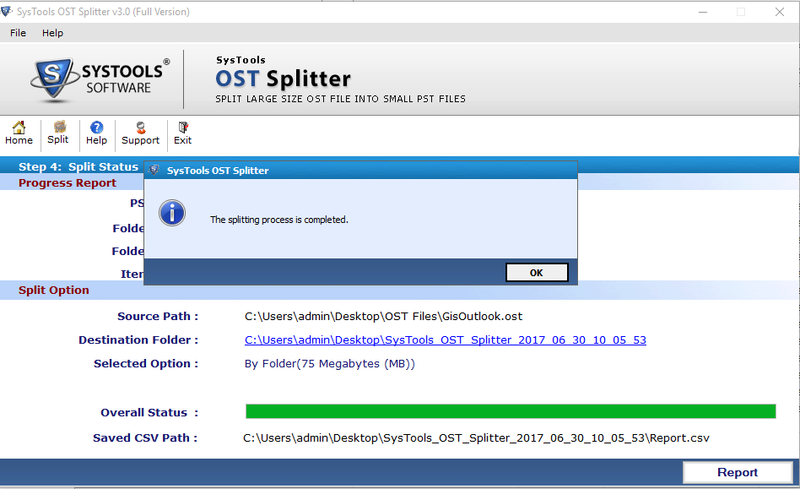 Split Large Outlook OST File into smaller PST Extension file using OST Splitter Tool. Convert the resulted file into Unicode format without discarding any important information. Split OST Tool give you Different Modes option to trim Outlook OST File. Such modes are: Data, Size, Year and Date. User can select the different mode according to desired need to split OST File. In this Option, a user selects the specific data in software prompt. This tool will create two PST Files as a result. First File stores all emails before the specified data and other PST File stored all the emails after the specified dates. Using File size options to truncate OST File into PST form, user can select the File size range to divide the large OST file into equal smaller parts of Outlook PST File. Select Size in MB and GB limits. An easy method to split OST File data by using "split OST by year" feature in Software to break OST File according to year. On the basis Year, software easily converts emails according to Year selected. For Each year a different PST file is created. The software offers to divide OST File Emails stored according to Folder. 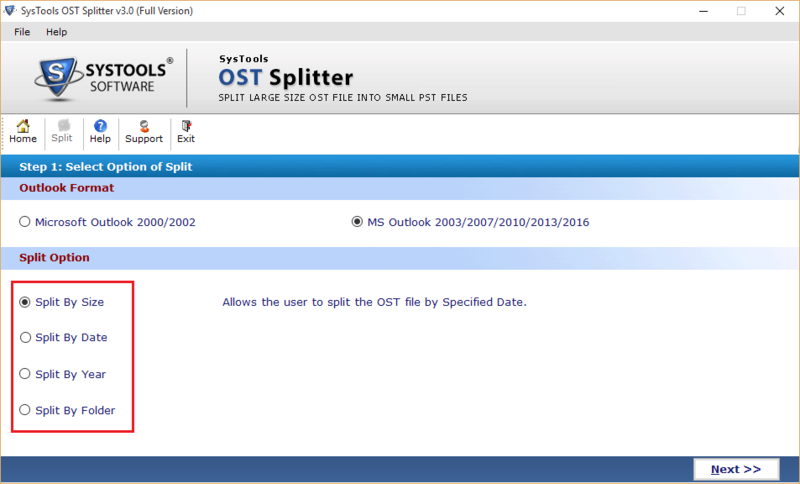 To divide according to Messages data according to Folder, select the Split by Folder option of OST Splitter software. An OST Splitter software used to divide OST File of the big size stored by Microsoft Outlook in user machine. 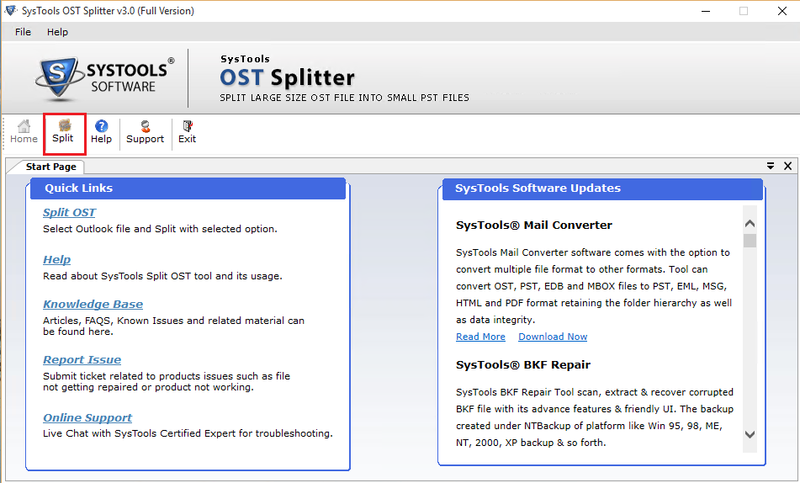 A user can apply different splitting given by OST Splitter Tool. Offer such as "Split by data" and "Split by Year". These features help a user to split OST File and save the according to these options. A user can also save the resulted PST File into different Folder and last not least user can split Outlook OST File according to desired file size. User can also save the details of the Splitting process in CSV File format, to deal with any information related to processing and can save this file in the desired location. As OST File created while working with the Exchange Mode and cache exchange mode. As the Size of OST File increases with a large number of messages and other details it is difficult by the user to manage it properly and then try to find the solution of " how to Split OST File". Hence OST File Splitter Tool can be used to solve all problems related to the size of OST File by splitting up into smaller PST File. Microsoft Outlook should be Installed and Configured Properly. Choose the Outlook Version from the list. Choose the split option from the list as per your need. Click Next. Software display the splitting process of the file. 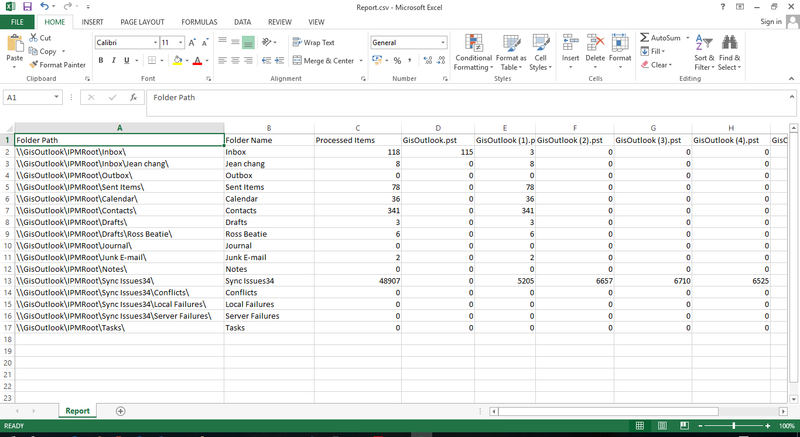 View Report of Splitting process in CSV File format. Split OST File Software- Replies All Doubts & Queries! Is software split the OST File according to different Year? Yes, the tool offers an option to split OST File according to the different year. Is there any size Limitation on OST file while splitting process.? 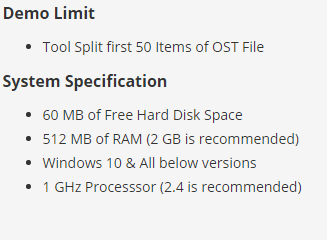 No, There is no file size limitation imposed on OST File while dividing OST File. Can Split OST File Tool delete any meta-data properties while OST Splitting process? No Data loss occurs while splitting the OST File, Tool also maintains the integrity of resulted in PST File. Is OST Splitter Tool create any report of splitting process ? Yes, a user can split Outlook OST File and save the report of the Splitting process in the CSV Format. Is there any Tool that can Split my PST File of Outlook 2016 Version? Yes, you can easily split PST file Outlook 2016 Versions & other below version of Outlook Applications. Overall great work by the developer team for creating this OST Splitter tool. Now able to divide Outlook OST File by saving my Time and Effort. Easy Navigation interface helps me a lot while splitting process of OST File. 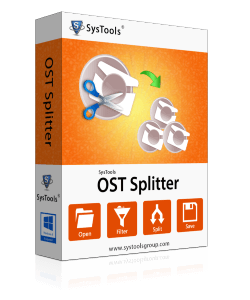 Try the Demo versions of the OST Splitter Tool. Now proceeding to buy the Full versions of the software to Split OST File, as exciting features of Demo versions solve my all problems related to Splitting my various Outlook versions OST File stored in the machine. Finally get a trustworthy tool to split Outlook OST file into PST file extension. Various options of Split surprises me a lot and really impressed by the performance of the tool. Within few steps able to split large OST File. Facing some error related to the Corruption in OST File, So decide to Split the OST File into sample file size to reduce to avoid future issues. Tool perfectly divide the File according to large size range.